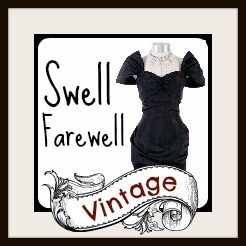 I’ve been following Allure Original Styles for a while, from her initial offerings through eBay as seller buddhaboogie (which is still used to sell what appears to be samples), to a full-fledged Etsy store where you can purchase custom made reproduction swing era garments. Allure Original Styles distinguishes itself from other reproduction sellers by creating an extensive line of pants and complimentary blouses. The fabrics range from wool gabardine to light-medium weight denim, to cover both dressy and casual pants needs. I am probably most excited about having wide leg denim options – while I love to dress up, sometimes you have you wear jeans for more casual occasions and shopping for jeans is only a step above shopping for a swimsuit on the loathsome activity scale. What could be more comfortable for everyday wear than a pair of flattering wide leg lightweight denim jeans? This 1940’s style striped dress from eBay seller buddhaboogie was too adorable not to post, even though it’s not in season. But then it’s never too late or early to shop for all things fabulous. 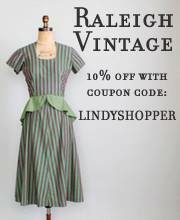 I’m in love with this candy striped dress – it’s made with a great vintage fabric and has a chevron skirt, matching belt, and flutter sleeves. It’s good enough to eat! I love this dress on eBay made of fabric that looks like flowers and peppermints at the same time! I’ve watched some other great items from the same seller, buddhaboogie – isn’t that George Gee’s handle?